It was May and I was in Cornwall, Britain. I arrived at the charming Cornish seaside village of Newquay in the afternoon. Very popular with visitors. One of Newquay’s beaches is home to ‘The Cribber’ a wave of up to 9 metres high that attracts the country’s top surfers and international competitions. A comfortable night and a pleasant breakfast the next morning. You can buy lunch packs from some youth hostels and I did, to take with me on my 11 mile coastal walk to Perranporth, a short section of the Cornish Coastal Path. I was still working through my cold, and coughing, so I bought a copy of the Sunday Times as well, just the thing for a Sunday in England. With these two necessities tucked in my pack I headed off down under the viaduct and out onto Gannel Road. Then crossed a footbridge over the small stream and followed it to its mouth at the sea. It’s very sunny and superb for walking. At low tide, there is a lot of sand with that seashore scent. Then to the village of Crantock, with its medieval stocks – last used in 1817, are still in the churchyard. The village well, the thatched cottages and the Old Albion Inn, a notorious centre for smugglers, make it an interesting spot. Up along the narrow hedgerow lined path. Pesky flies and other buzzing insects form aerial curtains. At last, the fresh sea breeze. Time for a rest and a sandwich. Slightly rested, on the coastal path. It’s hard going, but enjoyable. The sun, cliffs and a lovely sea swell. This is Poldark country (TV series). Winston Graham, the creator wrote his first Poldark novel while living in Perranporth. Some of this area is still owned by the military. It was lunchtime in Holywell Bay at the charming thatched building that is the Treguth Pub. Holywell’s most recent claim to fame was its use for the opening scenes of the James Bond film ‘Die Another Day’. 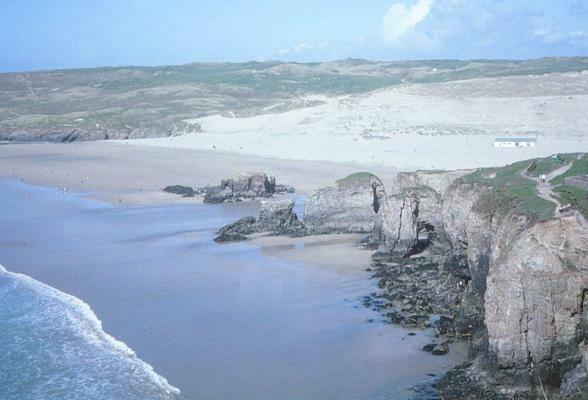 Holywell’s name refers to its narrow sea cave which can be visited at lower tides. This spot has been a pilgrimage in the past for healing the sick who were brought here to be dipped in the grotto like steps of red and brown stained calcium deposits inside the cave that hold the pools of holy water. Suitably refreshed, but reluctant to continue, I moved out and embarked on the last five miles. There were lots of Bumble Bees and small flowers along the track. Soon enough, I arrived at the surprisingly long two mile surf beach where people were actually surfing. I climbed down the steps to the golden sands and decided to have a bit of a snooze in the sun. After this short siesta, I made my way to the village of Perranporth. Perranporth’s name is inextricably linked with St. Piran, Cornwall’s Patron Saint of Tin Miners. Many years ago Piran was washed up on Perran Sands having been thrown over a cliff by King Angus of Muster in Ireland, who had tied him to a millstone. The millstone had of course floated, and brought St Piran over the Irish Sea to Cornwall. After landing on the sands Piran made a fire to warm himself and noticed a silvery liquid running from the hot stones below the flames. This was tin and so St. Piran became the patron saint of Cornwall’s Tinners. I made my way to the Youth Hostel, sited precariously on the cliffs above the beach. It was once a coastguard station, and had spectacular views of the Atlantic. Walkers can continue along the South West Coast Path. It was a small hostel, and very cosy. I met David, a nuclear engineer and his wife Clair. They were planning to walk to Newquay tomorrow.